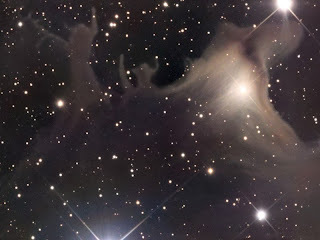 located about 1,200 light years away from us. If you have watched the recent sci-fi space movie, ‘Gravity’ (starring George Clooney and Sandra Bullock), you would have realised the extremely risky nature of space expeditions. When things go seriously wrong up there, death is almost inevitable. Before Neil Armstrong became the first human to conquer the moon, there had been hundreds of animals that were sacrificed in the name of space exploration. Animals such as monkeys, chimpanzees, dogs, mice and other animals were used as test subjects in space to analyse the effects of space environment such as microgravity and radiation exposure on human during spaceflight. she never return as a re-entry plan had not been worked out. Unfortunately, the earlier designs for spacecraft construction were still in the experimental phase. 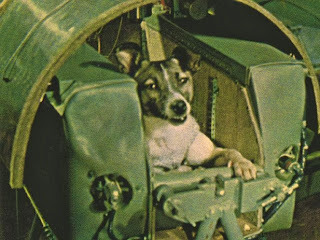 As a result, many animals that were sent for spaceflights died from starvation or dehydration during flight and in explosions while on board the shuttle. In some cases, the spacecraft in which the animals flew in were never recovered. This has led to speculations of abandoned ships that might be drifting in orbit together with their animal astronauts. It is not just animal deaths that happened during space travels. In 1971, three Soviet crew members of the Soyuz 11 spacecraft, Georgi Dobrovolski, Viktor Patsayev and Vladislav had died in space as a result of space decompression during preparations for re-entry. Technically speaking, these are the only human fatalities that occurred in space (100km above sea level) so far. 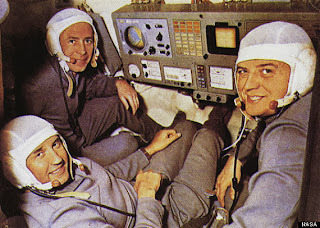 of Soyuz 11 were the first men to occupy the world's first space station. Happy Belated Mid Autumn Festival!